Taken 2007 by Neil France. 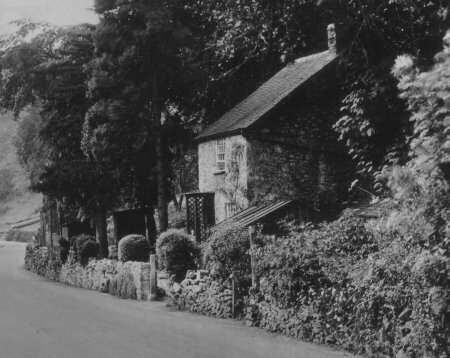 He writes: The cottage on the right of Via Gelia still stands , and is identifiable by the curve in the road past it and the pavement on the left, there isn't a lot of pavement up Via Gelia, so that was easily found. The cottage has had an extension added recently, and the chimney is now on the oppositte end. 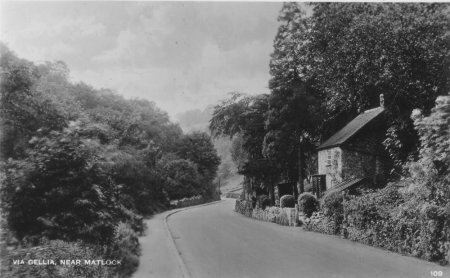 The road was named after Philip Gell of Hopton Hall who paid to have it constructed through the valley in 1791-2, improving access between his lead mines and the lead smelter at Cromford. The trade name Viyella originates from the fabric that was once produced at the textile mill in the Via Gellia. 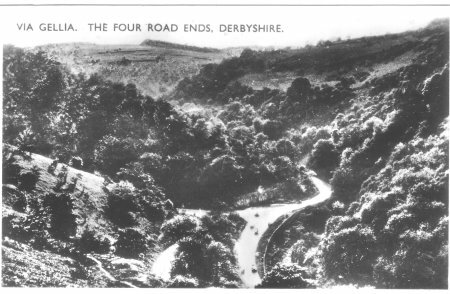 The junction is called "Four Roads End", where Via Gellia Road (the A5012 running Westwards - bottom right to top middle) meets New Road (the B5023, from Middleton), and a minor road from the South. 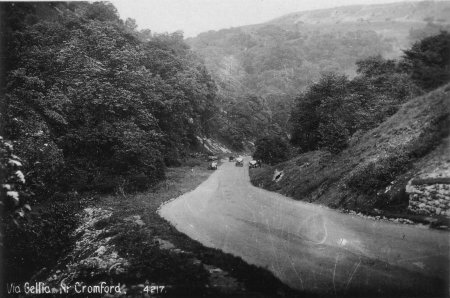 Whereas it is intended to apply to Parliament in the present Session, for Act of Repair, Widen, Alter, and Amend the Road leading from Cromford, in the parish of Wirksworth, in the county of Derby, along the Via Gellia, to Hopton, in the said county; and also to set out and make a New Road branching from the said Road, up the valley, between the Grisse and Hole by Grange Mill, to or near to Newhaven House, in the parish of Hartington, in the said county; and also to set out and make another New Road branching from the first mentioned road near the said valley, to the town of Wirksworth aforesaid. Unposted. 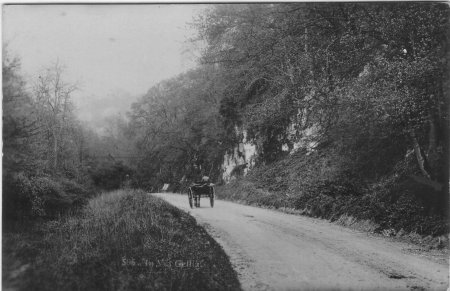 Horse and trap climb an untarmaced Via Gellia. Enlargement. 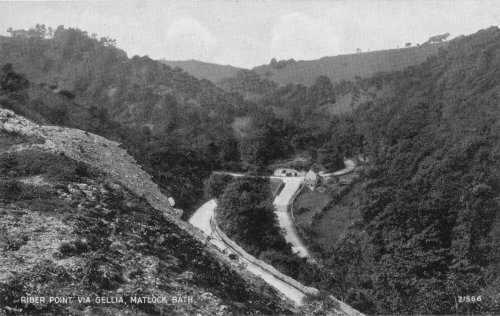 1920s traffic jam in Via Gellia - must have been a Sunday. Unposted. 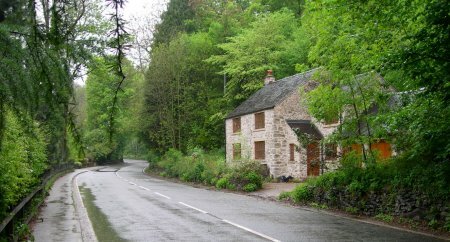 Delightful cottage on the Via Gellia. 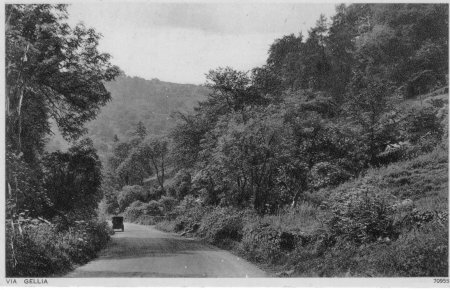 Have any more information about this photo? Compiled, formatted, hyperlinked, encoded, and copyright © 2004, John Palmer, All Rights Reserved.